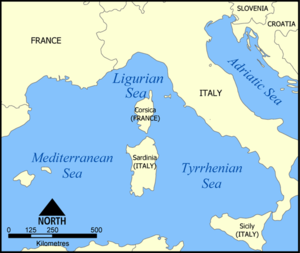 The Ligurian Sea ( ; ) is an arm of the Mediterranean Sea , between the Italian Riviera (Liguria and Tuscany) and the islands of Corsica and Elba . The sea is probably named after the ancient Ligures people. The sea borders the countries Italy , France , and Monaco . In the east the sea borders the Tyrrhenian Sea , while in the west it borders the Mediterranean Sea proper. Genoa is the most prominent city in the area. The northwest coast is noted for its scenic beauty and favourable climate. The Gulf of Genoa is its northernmost part. The sea receives the Arno River from the east and many other rivers that originate in the Apennines . The ports of Genoa, La Spezia , and Livorno are on its rocky coast. It reaches a maximum depth of more than 9,300 feet (2,850 m) northwest of Corsica. The stretch of water that separates the island of Corsica from the Italian mainland is known as the Corsica Channel . It is about 50 miles (80 km) wide and divides the Ligurian Sea from the Tyrrhenian Sea. In order to provide protection for the numerous cetacean (whales and dolphins; porpoises are not found in this part of the Mediterranean Sea) species in the Ligurian Sea the bordering countries established the sea as a SPAMI in 1999. The International Ligurian Sea Cetacean Sanctuary now covers 84,000 km² covering territorial waters as well as high sea.